Combine coconut and sugar, stir over a low flame till the sugar melts. Add the soaked breadcrumbs and stir till well mixed (for about 5 to 7 Min). Add chopped cashew nuts and oil or desi ghee and cook till the mixture leaves the sides of the pan. Spread into a greased any thali or pan and let it cool. Garnish with chopped cashew nuts and serve. 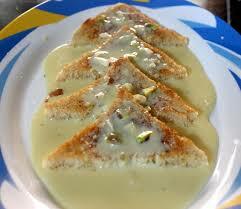 Its very yummy sweet dish made of bread and milk, quick and easy to make and rich in taste. Boil milk reduce to half, add sugar , cardamom powder saffron ( dissolve a little milk) When milk become thick off the flame and keep aside. Cut the all bread slices in to round shapes with the help of round shape cutter or katori. Keep the other pieces of bread on top of each (like sandwich.). Place on it a serving dish and pour the thick milk over it. Garnish with chopped nuts and serve chilled. continue to simmer for five minutes, stirring continuously. Remove from flame and chill it.Place bread pieces on a serving dish, pour chilled reduced milk on top, and garnish with dry fruits. Serve chilled. 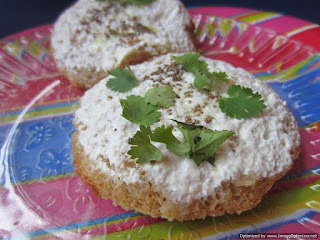 Bread Idli is a simple delicious recipe and mouth dissolving snacks. made with white bread. Use brown bread to eat healthy. 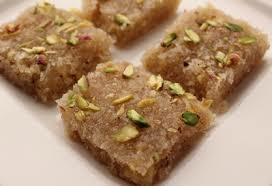 This is quick snack is quite filling and served with Coriander Chutney. Mash boiled potato and add green chilli, coriander leaves, chat masala and salt. Keep aside. Heat 1 tbspn oil in a small pan splutter mustard seeds and curry leaves and little amount of salt. To this pan, add curd and turn off flame. Mix it properly and keep aside.